Facing a Dec. 31 United Nations deadline, Sudan’s government agreed to a peace deal with rebel groups in the southern part of the country. However, even assuming Khartoum genuinely plans to comply with the peace — and that’s a huge assumption, given the government’s track record — this agreement does nothing about the greater problem in Darfur, and again demonstrates the timidity of the U.N. when it comes to opposing the genocide. “The label ‘humanitarian crisis’ conveniently absolves the rest of the world from taking political and military action in Darfur. By providing generous humanitarian assistance, governments and the UN claim to take meaningful action. But genocide cannot be resolved by donating blankets and food to the potential victims. The risks to humanitarian workers even caused the U.N. to suspend its food convoys last week due to more ceasefire violations. With international unwillingness to dispatch troops, the African Union remains responsible for supplying peacekeeping forces to protect aid workers and refugees. The AU has asked for international funds to help it deploy more troops, but hasn’t received them. 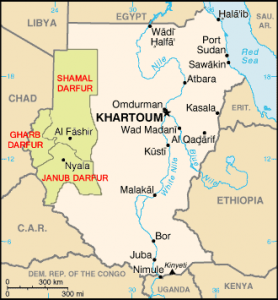 As a result, only about 900 AU troops are in Darfur (a region about the size of France), though the 53-nation coalition wants to send 3,000-4,000. After consistently punting when it comes to sending troops to Darfur, the U.N. has ironically now agreed to use its forces to enforce the peace in the south. U.N. envoy Jan Pronk announced Monday that the United Nations “will deploy between 9,000 and 10,000 troops as part of a monitoring force whose mission will not be to keep peace but to boost it” for an expected term of six years. In agreeing to police the south, the international community again demonstrated that its failure to intervene in Darfur (despite its own policy on genocide) is a matter of priorities rather than resources. The terms of the implementation also give Khartoum an inherent advantage if the international community eases the pressure (as noted above, the government has a much longer timeframe for withdrawal than the rebels). Considering its track record of using peace negotiations to divert attention from military buildups and planned attacks, the government’s willingness to actually comply with the peace deal remains in question. And Darfur remains unresolved, with attacks continuing, refugees still facing a dire situation, and the international community standing by for nearly two years.